The practice of Spiritualism—contacting the deceased by mediums-- is an arena close to the frailest optimisms of the human heart. It cruises inches from our deepest levels of regret and hope. It is a maelstrom of commitment. You cannot almost believe in the Spirits nor can you only believe in the Spirits a little. Communication with the ‘other side’ is as close as Western Society legitimately gets to shamanism. Certain commonalties are intrinsic; healing, acting as a conduit between the two dimensions of the living and the dead, and trance. The Mediums have been little documented from their historical viewpoint. Madge Gill, Edmund Monseil and Helen Wells were active earlier in the 20th century and were true Mediums. Wells was married to a wealthy man and lived in an upper class milieu where women were often not allowed to express themselves artistically unless it was disguised as a parlor pastime. When one examines the documents of Wells’ organization, the Jansen Society, as well as her own writings it is clear that she practiced with sincerity and commitment. Helen Wells was called Instrument 1 by Eswald, her spirit guide, and her adopted daughter, Norma Oliver, was called Instrument 2. Between them they channeled a broad array of historical luminaries including Bishop Cornelius Jensen, Ralph Waldo Emerson, Henry David Thoreau, Andrew Jackson, Thomas Jefferson, Tom Paine, Abraham Lincoln, Pythagoras and his group including Socrates and the Seven, Tecumseh and Osceola. 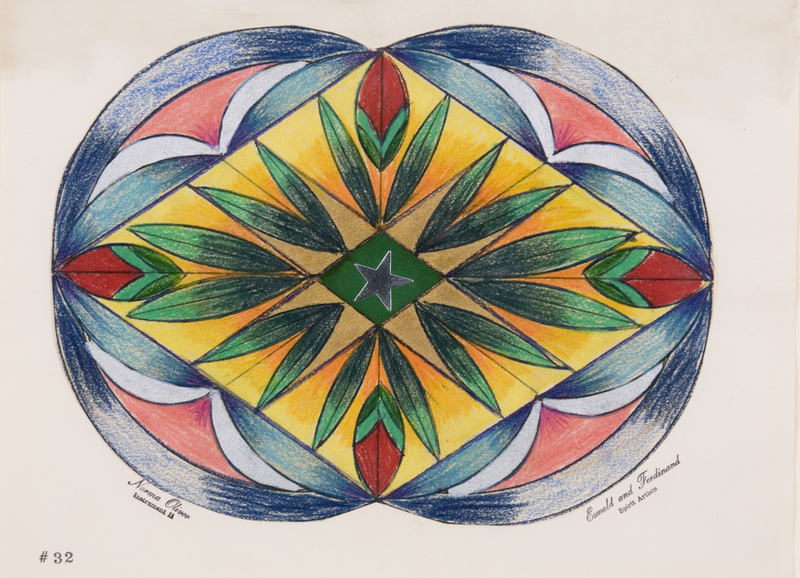 Well’s drawings seem to begin with a meandering line that then plunges into imagery, Norma Oliver made her own portraits of Jansen Society members by portraying them in color-specific mandalas. Agatha Wojciechowsky came to New York from Germany in 1923 where, after a series of menial jobs she became a medium and a healer. In 1952 the spirits she was channeling advised her to begin making art. A student tells the story of her going to Pearl Paint and randomly buying a variety of art supplies. The clerk asked what she would do with her purchases. “I don’t know but they will tell me”, she said. And they did, gloriously. Her work has many phases and complex elements ranging from pastels depicting a many-hued spiritual plane to color form abstractions to multitudes of spirit heads to tracings of hands and feet in which she drew the client of friends’ past lives.